Construction of large-scale commercial and industrial projects, initiatives to strengthen the non-oil sectors along with infrastructure development activities to prepare for upcoming mega events such as World Expo 2020 and FIFA World Cup 2022, would be some of the key drivers behind the growth of Middle East Industrial Refrigeration Systems market during 2018-24. Additionally, rising population, strengthening tourism along with government plans such as Saudi Vision 2030, Qatar National Vision 2030 and Dubai Vision 2021 are expected to further strengthen the industrial refrigeration systems market in Middle East over the coming years. Carbon Dioxide based industrial refrigeration systems are expected to register highest growth during 2018-24 due to their eco-friendly characteristics such as low ozone depleting potential. Further, many Middle East countries follow norms and regulations under the Montreal Protocol, leading to a higher adoption of systems utilizing ammonia, carbon dioxide or mixture of air & water for refrigeration purposes. The trend is anticipated to eliminate the utilization of systems based on hydrochlorofluorocarbons as these gases result in the depletion of ozone layer and pose potential threat to the environment. Additionally, Saudi Arabia and UAE are the key countries capturing major pie in the overall Middle East Industrial Refrigeration systems market share. The Middle East Industrial Refrigeration systems market report thoroughly covers market by power rating, types, verticals and regions. Middle East Industrial Refrigeration systems market outlook report provides an unbiased and detailed analysis of the Middle East Industrial Refrigeration systems market trends, opportunities/high growth areas and market drivers, which would help the stakeholders to device and align market strategies according to the current and future market dynamics. •	Middle East Industrial Refrigeration Systems Market Overview. •	Middle East Industrial Refrigeration Systems Market Outlook. Systems Market Forecast until 2024. •	Historic data of Saudi Arabia Industrial Refrigeration Systems Market Revenues 2014-2017. •	Market Size & Forecast of Saudi Arabia Industrial Refrigeration Systems Market Revenues until 2024. •	Historic data of UAE Industrial Refrigeration Systems Market Revenues 2014-2017. •	Market Size & Forecast of UAE Industrial Refrigeration Systems Market Revenues until 2024. •	Historic data of Turkey Industrial Refrigeration Systems Market Revenues 2014-2017. •	Market Size & Forecast of Turkey Industrial Refrigeration Systems Market Revenues until 2024. •	Historic data of Kuwait Industrial Refrigeration Systems Market Revenues 2014-2017. •	Market Size & Forecast of Kuwait Industrial Refrigeration Systems Market Revenues until 2024. •	Historic data of Qatar Industrial Refrigeration Systems Market Revenues 2014-2017. •	Market Size & Forecast of Qatar Industrial Refrigeration Systems Market Revenues until 2024. •	Historic data of Oman Industrial Refrigeration Systems Market Revenues 2014-2017. •	Market Size & Forecast of Oman Industrial Refrigeration Systems Market Revenues until 2024. •	Historic data of Rest of Middle East Industrial Refrigeration Systems Market Revenues 2014-2017. •	Market Size & Forecast of Rest of Middle East Industrial Refrigeration Systems Market Revenues until 2024. 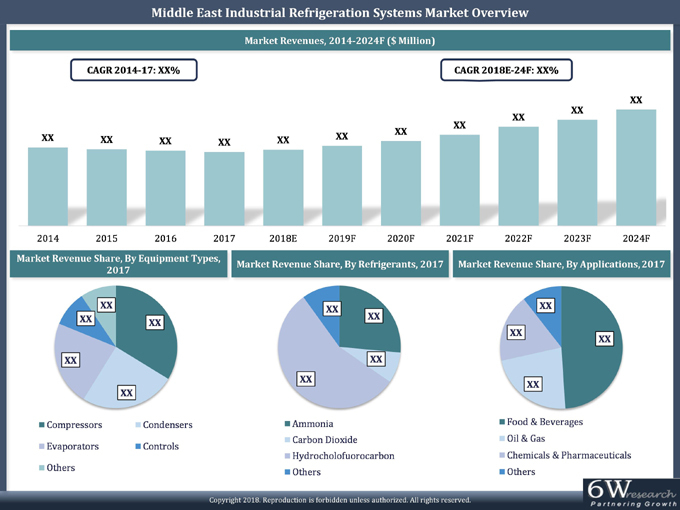 •	Middle East Industrial Refrigeration Systems Market Trends, Drivers and Restraints.